Flying on the tail of Apple’s new, iPad that is lighter, Amazon came out with a full size tablet with a lower price tag. Although the sales aren’t as high yet as the iPad Air, it is taking off as the strongest challenger yet to Apple’s newest devices. This review is on the Kindle Fire HDX 8.9” Tablet (2013 Edition) and is currently on sale at a discount at Amazon.com for $349.00, a great holiday purchase for anyone young or old. Some of the interesting features that it has are a large 8.9” display, with deep contrast and rich color. It would be great for movie watchers but it also has great features for apps and gaming with its dual stereo speakers for a rich, crisp sound and custom Dolby audio, how could you resist? For those popular games and apps such as Cut the Rope, Minecraft, Pandora, Pinterest, and Netflix this is just what Santa ordered. There is an ultra-fast web browsing and streaming that has built in dual-band, along with a dual antenna, Wi-Fi and a front facing HD camera for making video or taking those once in a lifetime Christmas photos. Of course there is easy to us e-mail, Gmail, Hotmail, calendar and contacts for home and work. Compared to the previous Kindle Fire HD the HDX runs three times faster, the battery lasts longer and is lighter in weight. There is fantastic display quality and the sound quality is beyond what you could hope for. The build quality is great and there is no blue haze on the 8.9”HDX allowing the contrast to be good and not buggy. 16 GB, 32GB or 64 GB of internal storage is available to the user. There is up to 12 hours of reading time or listening to music, watching a video or just surfing the web on Wi-Fi. If you only want to read the battery will last up to 18 hours. You can do a lot of reading in that length of time. Of course this will vary depending on the devices of the individuals. Check out the Best Special Offers at Amazon. Because of the dual-band and dual-antenna Wi-Fi means fewer dropped connections than the regular Wi Fi. There is a USB 2.0 port for connecting a PC or a Macintosh computer or to charge your Kindle using the charger that is included. A 3.5 mm stereo jack is included with the Dolby speakers. One of the most popular features of the Kindle Fire HDX 8.9” is the front facing 720p HD Camera with a wide-aperture 5P f/2.2 lens with an Electronic Image Stabilization and a 8MP rear facing camera with a LED flash. I have seen pictures made with this camera and you can’t tell the difference between this and a real photographer taking the picture. Then there is the super fast Kindle Power fast charger that charges in 5 hours that is included with the Kindle. Additional features include support for A2DP compatible stereo headphones, headsets and speakers along with external volume controls, built in dual microphone, built in Bluetooth that supports different wireless accessories like controllers and my favorite is my keyboard. This is one accessory that is on top of my list. It is convenient and is always ready and comes with its own charger. Enabling access to the vast majority of Kindle Fire features is the screen reader, screen magnifier and Explore by Touch. The natural language text-to-speech voice is represented by the screen reader that features IVONA’s voice and includes a built in Oxford dictionary, and an adjustable font with sizes and color. This computer is ready to begin with no computer required to download content, and no software to install. There is a one year warranty and an optional extended warranty for two years. The new Kindle Fire HDX 8.9” replaces the old Kindle and is a great buy. Check out the prices as Black Friday comes they are expecting a huge crowds and lots of traffic and people that are in bad moods. So fix that cup of hot chocolate, put your pajamas on and get that Christmas list out. Doing your Christmas shopping doesn’t have to be stressful and painful, You can do it at your own pace , however, you might want to start early so you won’t miss out on anything. 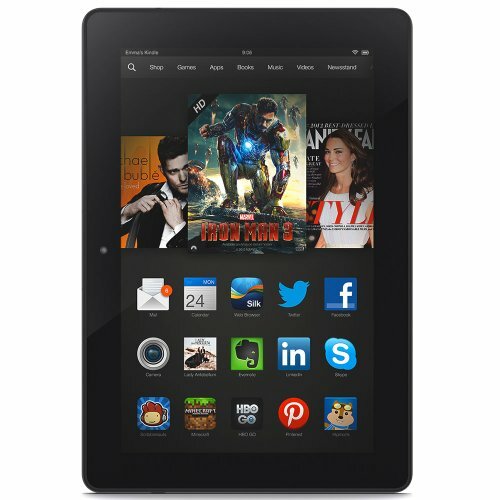 The Kindle Fire HDX 8.9” Tablet is a great Reading and Gaming Tablet, Business Use and Best Movie Tablets. All the reviews are good ones so I don’t see what you have to lose by ordering yours today. And the big day will come and you will agree that all sales should be final because no one will not like this one. Kindle Monthly Deals April 2014: New Reads Just in Time for Spring!